Hope you all are doing well..
1) Impact Of Toys In Child Learning . Impact of Toys in Child’s development Process ! In Sponsor with Skola Toys ! 2) Learning Journeys Designed As Play . Learning Journeys designed As Play ,Feat. Skola toys !! I Hope You All Read Them & Find It Useful For Better Learning Of Your Kids. Today I’m Sharing With you Guys My Honest Reviews About The Product , the Brand Send Us For Review. So Friends, We recieved This Set Of Locking Blocks. Suitable For Ages 5+ . This Toy Is The Stage 4 Of Their ” Journey Through Patterns ” That Enable Finest Learning . 3) A detailed instruction manual. OUR little skolars have to InterLock the wooden pieces into one another in the correct sequence to solve and complete the puzzle, Given in the box . This creative jigsaw puzzle is fascinating for children who lock each piece together by trial and error till they realise the colour pattern on the puzzle. Once they manage to do so, they find it more fun to repeatedly dismantle and rearrange the blocks. As children analyse and retain the shapes’ attributes and match the pieces together to make the complete picture, they use sequencing and deduction which develops overall logical reasoning. Building with jigsaw blocks of different shapes gives children an insight on various aspects of geometry. Since the shapes are both symmetric as well as non-symmetric, there is an understanding of direction as well. Children love to explore and create new patterns with these jigsaw blocks. This enhances their creative and thinking ability. Inserting the jigsaw blocks in one another helps children develop fine motor skills and fosters dexterity. Once children have learnt to apply their knowledge of identifying and creating patterns in a linear manner, they are ready to try and do the same with more complex patterns. How To play This Jigsaw ? Their Can be two activities to be play with this Jigsaw . Take the pieces out & show the child how to connect the blocks by placing the extension into its complementary pair and creating patterns. Ultimately the child has to fit all the blocks into the square for it to go back to its tray. Initially children may end up creating long patterns by randomly connecting all the blocks. This is a great exploratory and creative activity for them. Take Out all the Pieces. Show your child how to sort by colour. Then show them how to solve. So if you have a red , it will be surrounded by green, yellow and blue. No colour touches itself in the block, so children start configuring patterns now on the basis of shape and colour. HOW this Journey Through Patterns CAN be Helpful ? By identifying and pairing objects that are specifcally arranged, solving picture puzzles and distinguishing the objects that break sequences, children comprehend simple and abstract patterns. This journey is one that directly leads to logical reasoning, problem solving and visual discrimination skills. 1) It keeps the little hands busy with a sequence of blocks that go from Locking with one hand to complex manipulation using two hands helps children gradually build fine motor skills, and enables them to use their hands capably for daily tasks. 2) Children Love To Explore and create new patterns with these Blocks. This enhances their Creative and thinking ability..
3) Using Shape as an attribute in these jigsaw blocks gives children an insight on various aspects of geometry. Since the shapes are both symmetric as well as non-symmetric , there is an understanding of direction as well. 4) It Helps in pattern sequencing. A children analyse and retain the shapes attributes and match the pieces together to make the complete picture, they are sequencing and deduction which develops overall logical reasoning. P.S : My Younger Son Also Wants To Play these along With her elder Brother. ?? Their Exciting range of toys for children of age 1, 2, 3 4, 5, 6, 7 years focussed on gross motor, sensorial, language, mathematics, science, cognition & creative skills. They Create toys which helps the child to play independently, build confidence, enhance fine motor skills, provide avenues for creativity while enabling the child to experience various aspects of dimensions. They have a wide variety of wooden educational toys to choose from which are equally fun and meaningful ! Starting From Ages 1-7 , They Guys can cover all our needs ..
Skola Toys create opportunities for your child to acquire, practice and gradually perfect new skills. Young children achieve milestones across the cognitive, fine motor, gross motor, language and social-emotional domains, and different toys encourage development in one or more of these developmental areas. Enable their future generations to play, explore and discover through “Learning Journeys Designed As Play “..
Do Check out The Entire Range . I’m sure their is something for every child according To his / her taste ..
I’m Very Thankful to The brand for taking this Spectacular Initiative ?? Kudos to The Team …. Mommies Do Order Some Toys For Gifting , This Diwali Season & Make Your Child More Happy. GIFT Them a Life to remember..
& Enjoy Free Shipping Too..
Have A Fantabulous Week Ahead ..
N Do take Care of yourself and your little ones ..
Dono hi bacche kitne cute hain ???? Dhanteras ki hardik subhkamnaye ???? I am really fond of unique learning toys and skola kids is just what i needed. Thanks for the review. This sounds so much fun for lil kids! ? This reminds me of my childhood. I used to love such toys. these toys are interesting, interactive and fun to play with while learning. Wow, loved these locking toys, indeed would be cool for my son. Shall get one for him. I am really in love with skola toys.. this one is too good to develop colour identifying skills in kids! They have made it like the puzzle and it will definitely keep the kids occupied for awhile. Going to order these soon. Looks like a great toy! My child loves to play puzzles! He might enjoy this. Toys that teach. 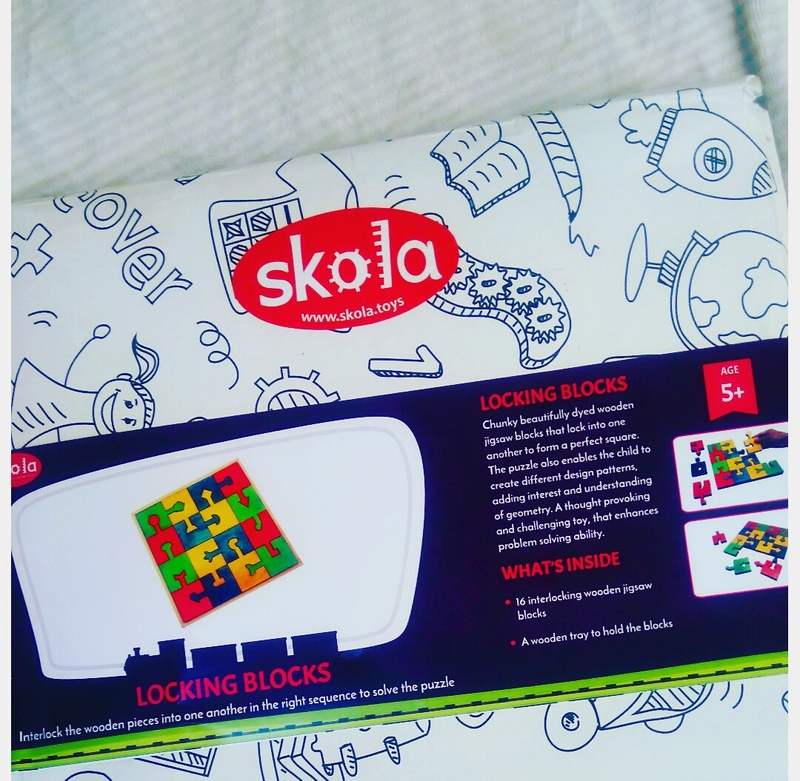 Skola has been coming up with brilliant toys. My kiddo too loves puzzles and this looks interesting. I’ve heard only good things about Skola toys and their usefulness in teaching kids. I love Skola’s range of learning toys. Will definitely be getting this one for my boy when he is older.